Reston, Va. and Washington, D.C. — The U.S. Geological Survey (USGS) and the U.S. Department of Energy (DOE), in partnership with DOE’s Lawrence Berkeley National Laboratory and the American Wind Energy Association, released the United States Wind Turbine Database (USWTDB) and the USWTDB Viewer to access this new public dataset. “The USWTDB directly supports the North American Aerospace Defense Command (NORAD) air defense mission by enabling us to conduct credible and meaningful analysis of wind turbine-radar interference impacts, and ultimately helps ensure that U.S. renewable energy does not adversely impact our ability to conduct our homeland defense mission,” said Major-General Christopher Coates, NORAD Director of Operations. Other examples of uses for the data include studying wind energy and wildlife interactions, reviewing economic impacts assessments of wind energy’s deployment, and better understanding of local wind deployment trends. With the release of the database, data that were previously scattered across many datasets and in some cases unavailable to the public have been released to the public in a single package via the USWTDB. The database currently contains data from more than 57,000 turbines, constructed from the 1980s through 2018, in more than 1,700 wind power projects spanning 43 states plus Puerto Rico and Guam. 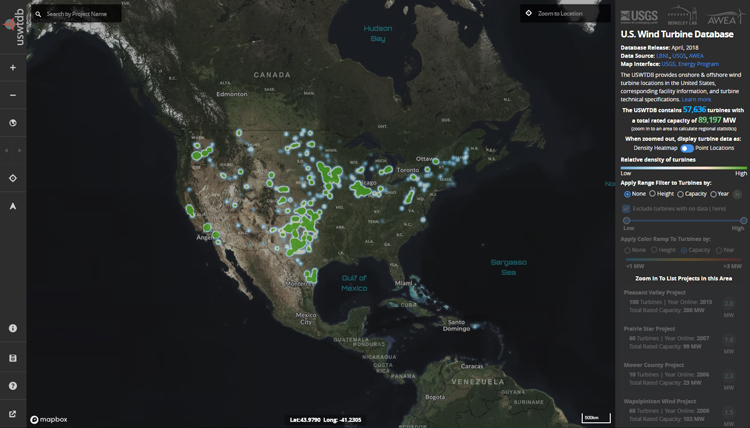 Access the USWTDB Viewer at https://eerscmap.usgs.gov/uswtdb/viewer/#3/37.25/-96.25.